Congratulations! You’ve found my 2018 mirrorless camera buying guide – a list of my current favorite mirrorless cameras. If you’re shopping for a DSLR or mirrorless, interchangeable lens camera, this article will tell you everything you need to know. Mirrorless cameras have replaced digital SLRs as the best interchangeable lens camera option for most photographers. And rightfully so: they’re smaller, lighter, less conspicuous and offer better features and performance than most DSLRs. With very few exceptions, when people ask me what camera to buy, I recommend a mirrorless camera over a digital SLR. This mirrorless camera buying guide will give you an overview of the pros and cons of the various mirrorless camera systems followed by detailed information and shopping links for my favorite mirrorless cameras. Just a few years ago the digital SLR was the pinnacle of photographic technology and performance. That’s not the case anymore, though. Most real innovation is now happening with mirrorless cameras. DSLRs are fast becoming specialty tools for professional sports photographers, commercial photographers, and photojournalists. There are great DSLRs, of course. But most photographers – even pros – would be better off with a mirrorless camera. By dispensing with the traditional SLR’s mirror and optical viewfinder, camera makers are able to make mirrorless cameras much smaller and lighter. Size is the most obvious difference between digital SLRs and mirrorless cameras. Removing the mirrors and/or prism required for a DSLR’s optical viewfinder allows camera designers to make mirrorless cameras much smaller and lighter. That’s great since most of us are better served by a smaller, lighter camera. Even pros who already have a full-size DSLR will benefit from having a mirrorless camera as a backup. The reality is you can now get nearly the same performance from a mirrorless camera that you do from a DSLR. Mirrorless image quality is as good or better, mirrorless cameras offer the same features and control (sometimes they’re even better than a DSLR), and because most mirrorless cameras and lenses are smaller and lighter, there’s a lot less temptation to leave them at home. There are very few situations where I wouldn’t rather have a mirrorless camera than a digital SLR. There are two areas where mirrorless cameras still fall short of digital SLRs: auto focus performance and lens selection. Mirrorless systems are getting closer by the minute, though; and for most people they’re probably just as good or better than DSLRs. Let me elaborate on auto focus because I’ve found most people don’t really understand. There are two types of auto focus – single-shot and continuous. Most people only use single-shot AF and that works great in mirrorless cameras. In fact, single-shot auto focus is actually better in mirrorless cameras than it is in DSLRs, now – especially in poor light. But if you’re a professional sports photographer who relies on continuous auto focus to track moving subjects (I do), then a professional-level Canon or Nikon DSLR is still your best bet. There are a few mirrorless cameras now that are approaching Nikon and Canon AF performance. The Sony Alpha A6500 and Sony A9 have excellent continuous AF performance. It’s still not quite as good as Nikon or Canon’s best but it’s very close. I’ve also been hearing good things about the Olympus OM-D E-M1 Mark II, although I haven’t been able to try it for myself. All three cameras are listed, below. Because mirrorless camera systems have only been around for a few years, dedicated lens options are still somewhat limited. That’s changing quickly though, with many new lenses every year, including pro-level fast-aperture primes and zooms. Olympus has been doing an especially good job rolling out new, pro-level lenses for their Micro Four Thirds mirrorless system cameras. There are also adapters for almost any kind of mirrorless camera/lens combo you can think of, including converters that enable auto focus with non-native lenses. That makes transitioning from a DSLR system a lot easier because you can buy a converter and continue to use the lenses you already own. Or if there’s a specific lens you really like, you can probably use it with the mirrorless camera of your choice. There are more variables with mirrorless cameras than DSLRs, so choosing the best camera is a bit more difficult. You need to be more thoughtful about sensor size, camera size, lens options, camera features and camera performance. For me, the purpose of a mirrorless camera is convenience and portability. So I want a camera that’s significantly smaller and lighter than my DSLRs. That may not be the case for you, though. Think about what it is you want your camera to do and choose accordingly. Sensor size is one of the more important considerations when choosing a camera. Currently, there are five or more different sensor sizes being used in mirrorless camera systems – from one-inch chips to 24x36mm “full-frame” sensors. There are even a couple of medium format sensor mirrorless cameras, although we won’t concern ourselves with those in this guide. Sensor size is a game of compromise and you need to decide what sensor best fits your needs. Smaller sensors allow camera makers to make smaller cameras and lenses. However, sensors with less surface area don’t produce the same image quality as larger sensors. Larger sensors will always produce better image quality. They also mean bigger, more expensive cameras and lenses. 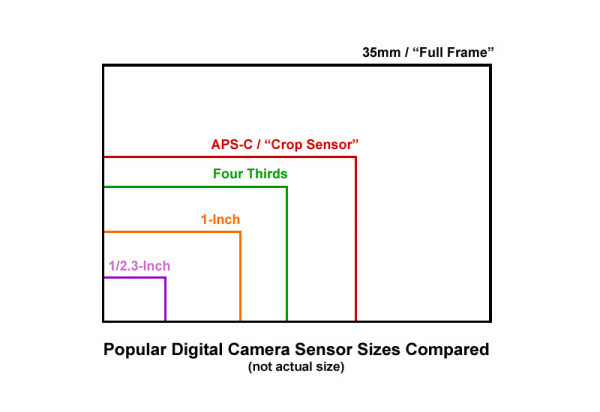 The diagram below shows the relationship between different sensor formats, from 24x36mm “full-frame” down to 1/2.3-inch, the standard sensor size for most point-and-shoot cameras. Personally, I think Panasonic and Olympus nailed it with the Four Thirds sensor. It’s small enough that they’re able to make cameras and lenses considerably smaller than most of the competition without noticeable image quality compromise. Even low light quality is surprisingly good – especially if you have a fast aperture lens. APS-C sensor cameras do have better image quality, though. The question you need to yourself ask is, “What do I really need?” Personally, I choose a mirrorless camera for its smaller size. I think the Four Thirds format is the best mirrorless sensor size for most people, followed by the larger APS-C sensor. 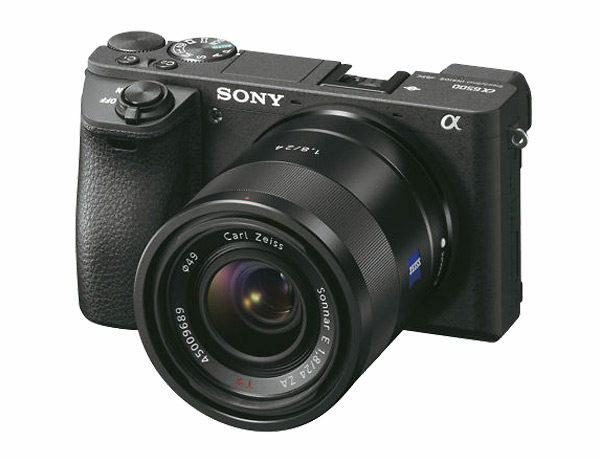 For professional photographers and others who don’t want to compromise image quality at all, Sony’s full-frame mirrorless cameras offer top-level professional performance in a surprisingly compact camera. One thing to keep in mind however, is the larger the sensor, the larger the lenses will be. So even though Sony’s full-frame mirrorless camera bodies are relatively small, the lenses are the same size as comparable DSLR lenses. That means a Sony full-frame mirrorless camera kit ends up being about the same size and weight as an equivalent digital SLR system. Sensor size is the main determining spec for image quality but it’s not the only thing you should consider when choosing a camera. If you’re used to point-and-shoot or smart phone cameras, you might be perfectly happy using the LCD display to compose. But if you’re looking to replace a DSLR, you probably want a camera with an eye-level viewfinder. The viewfinders in mirrorless cameras are all EVFs – electronic viewfinders. They’re essentially tiny LCD displays. There are photographers who don’t like EVFs – probably because they used to be grainy and slow to refresh. That time is long gone, though. I prefer an EVF over a traditional optical viewfinder, now. They allow you to use camera menus and review photos and videos without removing your eye from the viewfinder; they can emulate exposure adjustments; and you can use the EVF while recording video, which adds a third point-of-contact with your body, improving the steadiness and quality of handheld video. I can’t emphasize this point enough – if you record a lot of video, having a camera with an EVF will make a huge difference in the quality of your videos. Built-in Wi-Fi is a feature I really don’t want to be without anymore and I believe every camera should have it. With built-in Wi-Fi you no longer need to take a picture with your “real” camera and another with your phone for social media. Built-in Wi-Fi allows you to wirelessly transfer photos and videos from your camera to your phone so you can share them on the spot. Just connect your phone to your camera (the camera broadcasts its own Wi-Fi network), transfer the photo and use your favorite apps to process and share – just as you would with smart phone photos. Only with built-in Wi-Fi you’ll have all the benefits of your mirrorless camera’s larger sensor, better optics and better controls. The only camera in this guide that doesn’t have Wi-Fi is the Nikon 1 AW1 waterproof camera. Now that we’ve gone over the basics of mirrorless technology, let’s move on to my favorite mirrorless cameras. If you disagree with my camera picks or think I’ve left an important camera out, feel free to share your thoughts in the comments section at the end of the article. Remember these are my favorite mirrorless cameras, based on my needs and preferences. I encourage everyone to share their opinions and experience. Your comments help make this a better mirrorless camera buying guide. If you found this article useful please share it with your friends and use the red “Buy It” links to shop. Using those links help me cover maintenance costs for this site and continue to keep this camera guide current. As much as I like making camera recommendations for my friends, time is money and I can’t afford to do this for free. Thanks for your understanding and support. The Sony A6500 is the mirrorless camera I’ve recommended the most over the past year. It’s a true professional-level mirrorless camera with a body, speed, image quality and video that will meet the needs of all but the most demanding photographers and videographers. With 425 phase-detect AF points covering nearly the entire sensor, Sony claimed best-in-class auto focus performance when they announced the A6500. It can fire up to 11 frames per second for over 300 shots – on par with the very best professional digital SLRs. The electronic eye-level viewfinder steadies the camera for video and lets you review images and menu settings without taking your eye away from the camera; and the touchscreen LCD display makes it easier to precisely select and move your focus point. The A6500’s video specs are impressive, too. It has 4k video, records full HD as fast as 120 FPS and has a wide range of built-in time lapse settings. We recently bought an A6500 for the Alta Ski Resort marketing team and I’ve been using it to shoot Alta’s Photo-of-the-Day, this winter. The image quality is better than my Canon 7D Mark II DSLR, the auto focus and speed work great for ski photos and it’s an outstanding lightweight video rig. If you’re serious about control, speed and quality, the Sony A6500 remains my top mirrorless camera recommendation. 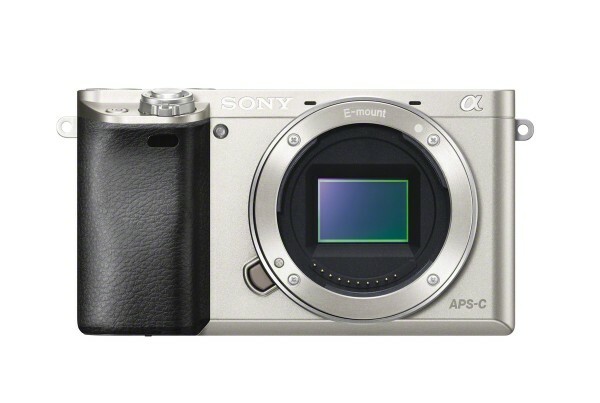 If the price puts it out of reach for you, then take a look at the Sony A6000, my previous top pick. It’s discontinued but still available and sells for hundreds less than the A6500. Using the red “Buy It” links on Photo-John.net helps us keep this Web site up and running. Thanks for supporting Photo-John – tell a friend! The Olympus OM-D E-M1 Mark II earned its spot in this list by being an absolutely perfect travel camera. The Four Thirds sensor (see sensor comparison graphic, above) keeps lenses small and allows for super-compact, travel-friendly camera kits. The OM-D E-M1 Mk II’s 20-megapixel Live MOS sensor produces surprisingly good image quality considering the sensor size. Up to ISO 1600, most people won’t notice any difference between E-M1 Mk II images and those from cameras with larger sensors. Built-in 5-axis image stabilization allows for slow shutter speeds that help keep ISO low and images sharp. If the standard 20-megapixel resolution isn’t enough, the E-M1 Mk II also has a 50-megapixel Hi Res mode that combines multiple exposures into one ultra-high-resolution image. The OM-D E-M1 Mk II is one of the most intuitive and comfortable cameras I’ve ever used. As far as performance goes, the E-M1 Mk II competes with the best. It has a 121-point hybrid auto focus system and can shoot full-resolution RAW bursts as fast as 60 frames-per-second (electronic shutter). My experience with previous Olympus mirrorless cameras, including the original E-M1, is the continuous auto focus can’t keep up with really fast action. So if you’re primarily a sports shooter, the E-M1 Mk II wouldn’t be my first recommendation. Travel, landscape and people photographers, however, will be amazed by how much performance and quality the Olympus OM-D EM-1 Mark II packs into such a small, inconspicuous package. It really is the ultimate travel camera. 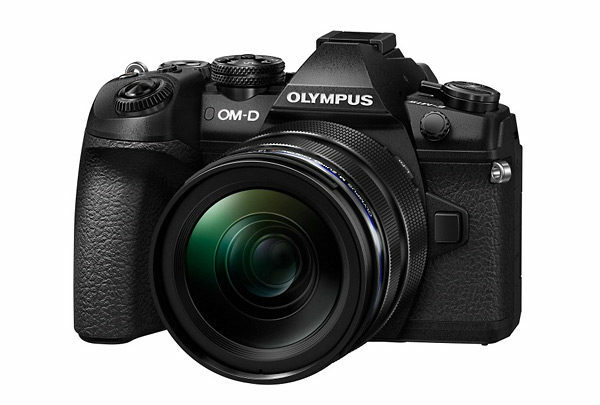 If you like the looks and features of the OM-D E-M1 Mark II but it’s out of your price range, consider the much more affordable Olympus OM-D E-M10 Mark III, instead. Because of its rugged, waterproof versatility and excellent action performance, the Nikon 1 AW1 has been in every iteration of this mirrorless camera buying guide. 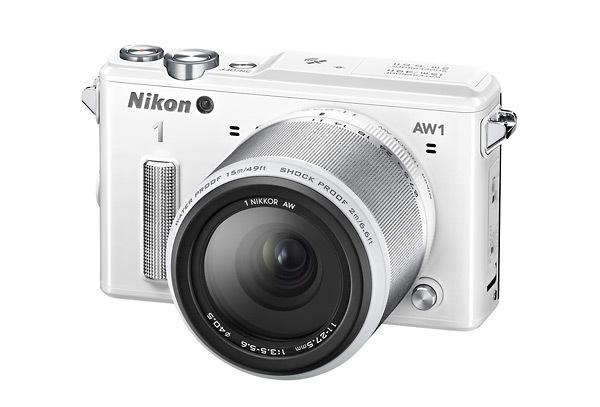 If you’re a mountain biker, SCUBA diver, snowboarder or any other kind of outdoor, action sports aficionado, the Nikon 1 AW1 is the camera you’ve been dreaming of. It has amazing action shooting capabilities with outstanding continuous auto focus, great full-HD video and the ability to capture still photos at a mind-blowing 60 frames per second. But what really sets the AW1 apart is it’s the only interchangeable lens digital camera you can take in the water without a protective housing – up to 49 feet (14.9m) deep! If you spend any time taking pictures or recording video in the water, rain or snow, the Nikon 1 AW1 should definitely be on your mirrorless camera wish list. The only feature it’s missing is built-in Wi-Fi. The Olympus “Pen” cameras were among the very first mirrorless cameras to hit the market and I’ve been a fan from the beginning. If you’re looking to step up from a smart phone or point-and-shoot camera, the Olympus Pen E-PL8 is a great choice. 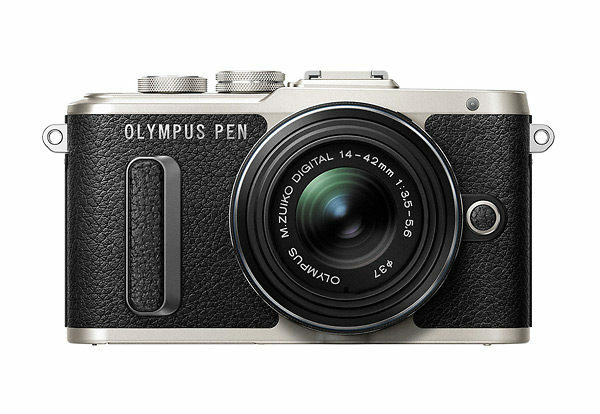 It’s got beautiful retro styling and many of the same features as Olympus’s high-end OM-D cameras, but in a much smaller, more affordable and user-friendly package. The E-PL8 has a 16-megapixel Four Thirds format sensor that produces far better image quality than any smart phone or point-and-shoot camera. The PASM shooting modes give you plenty of control (the E-PL8 also has full auto and scene modes) and Olympus’s Art Filters let you apply all kinds of cool in-camera effects to your photos and videos. Even your selfies will be better, thanks to the E-PL8’s handy flip-up touchscreen display. There are lots of great things about Fujifilm’s X-Series mirrorless cameras – the stellar Fujinon lens line (even the 18-55mm kit lens is excellent), sturdy metal build, sleek vintage styling, metal dials, etc. But for me, the main selling point is Fujifilm’s fantastic X-Trans sensor. In my opinion, it’s the best APS-C sensor on the market, with a subtle tonal range that really sets the X-Series cameras apart from other camera systems. Fujifilm makes a wide range of X-Series cameras, from the pro-level DSLR replacement X-T2 DSLR-replacement camera, to the simple and affordable X-A10. My current favorite is the handsome yet inconspicuous X-E3. Although it doesn’t get same the attention as the larger, flashier XT bodies, it has many of the same features and nearly identical performance. 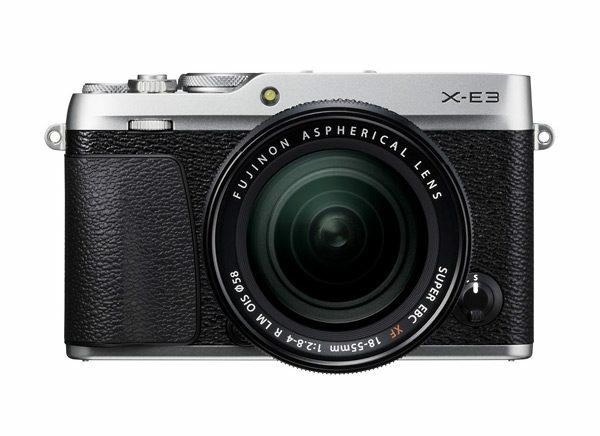 For a people, street and travel camera, the Fujifilm X-E3 has everything you need – a 24-megapixel APS-C X-Trans III sensor, 14-FPS burst, 4k video, electronic viewfinder, touchscreen LCD display and built-in Wi-Fi. Aimed at professional sports photographers and photojournalists, the Sony Alpha A9 is the pinnacle of mirrorless camera tech and performance. 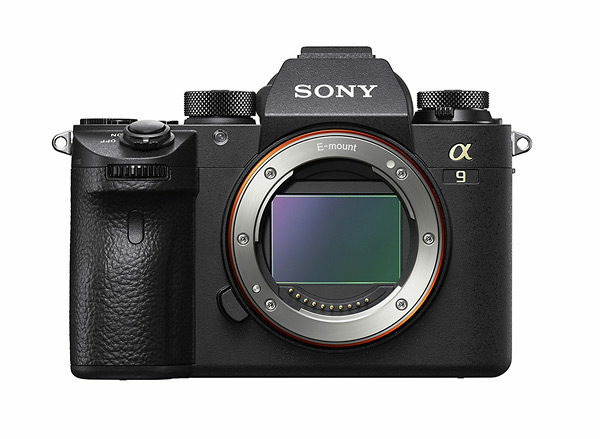 The A9 is a pro-level, full-frame mirrorless camera with a brand new BSI stacked sensor, built-in 5-axis image stabilization, 4k video, groundbreaking speed, a zero blackout EVF and Sony’s impressive 4D hybrid auto focus system. If you’re looking for professional durability and performance without the bulk and weight of a Nikon D5 or Canon EOS-1D X Mark II, then the Sony A9 is your camera. In many ways it outperforms Nikon and Canon’s flagship rigs. The EVF has no blackout at all, something no other mirrorless camera or DSLR can claim. The new 24-megapixel BSI stacked sensor delivers great image quality in all kinds of light and the electronic shutter makes the camera extremely fast and completely silent. The A9 can make exposures as fast as 1/32,000 of a second and machine gun off bursts at 20 frames per second, with continuous auto focus. That’s faster than Nikon or Canon’s best. If you need to capture the exact moment a baseball bat or golf club makes contact with the ball, you’ll be able to do it with the A9. The electronic shutter also makes the A9 absolutely silent, something wedding, golf and wildlife photographers will appreciate. Another big benefit is Sony’s 4D Focus AF system, which offers wide coverage (693 AF points covering 93% of the sensor) and fast, accurate tracking. The auto focus still isn’t quite as good as Nikon and Canon for some kinds of action. But if you’re not already using a Nikon or Canon pro sports body or you’re not a serious action photographer, the 4D Focus tracking will blow your mind. There are a couple of downsides to the Sony Alpha A9. The biggest for most people will be the price tag. I doubt many of my readers are prepared to spend $4500 for a camera without a lens. The next issue is the camera size. Although the A9 is smaller than most DSLRs, it’s larger than every other camera in this guide and the full frame lenses are huge compared to most mirrorless camera lenses. That means an A9 kit with body and lenses will end up being about the same size and weight as a full-frame DSLR system. That doesn’t negate the benefits of the A9 – it’s still a better camera for most photographers than a DSLR. But one of the main benefits I look for in a mirrorless camera – decreased size and weight – is lost. If you like the looks of the A9 but want a smaller more affordable version, go back to the top of the page and take another look at the Sony Alpha A6500. I hope my this buying guide helped you better understand mirrorless cameras and I hope you found something that fit your needs in my recommendations. Mirrorless cameras are now the best option for almost everyone who wants a high-performance interchangeable lens camera. The benefits of DSLRs have mostly been eclipsed by mirrorless camera technology and in a few years we will probably see digital SLRs as awkward, clunky anachronisms. My recommendation is to invest in the future and the future is mirrorless. As I said in the intro, the cameras listed above are my personal favorites. If I left out a camera or brand you think is important, please tell us about it in the comments section at the end of this article. If you found this article useful please share it with your friends and use the red “Buy It” links to shop. Using those links helps fund Photo-John.net and makes it possible for me to continue writing and updating camera buying guides like this one. I sure like my four thirds format Olympus OM-D EM-5 mirrorless SLR. I take it everywhere on my bicycle, and I get a lot of good pictures. The sensor is so fast I almost never need the flash (I don’t even carry it (the flash) most of the time, so on those rare instances when I need it, I haven’t got it, but that’s a small price to pay). It would be hard to persuade me to go back to my huge Canon with the monster lenses. I have a Ricoh GR which has been great for a pocketable take-along unit. I’ve bought into the Fuji system recently though, and have been having great results with the X-E1, which are extremely affordable now the E2 is out. It’s made my Canon consumer level DSLRs paper weights. I’ll be first in line for the Canon 5D IV, but that’s for paid gigs. I’m convinced. I changed from a Sony DSLR to an Olympus E-P3 a few years ago while doing automotive photography. Loved the smaller footprint, less weight, and most importantly the picture quality. Recently upgraded to an Olympus OM-D E-M1 and pro-grade lenses to match. There were a few more buttons and dials to learn, but everything is picture-perfect for all the web-publishing that I do. Sony alpha A6500 is good for beginners? And thanks for the insightful article!